The IDF in a joint operation with the Shin Bet foils a planned terror attack, as IAF aircraft kill two terrorists in southern Gaza. The IDF, in a joint operation with the Israel Security Agency (Shin Bet), was able to foil a planned terror attack in Israel on Wednesday evening, as IAF aircraft struck and killed two terrorists in southern Gaza. The two terrorists, Ashraf Saleh and Anis Abu Elenein, were members of a group calling itself “The Al-Aqsa Defenders”, which the IDF said is supported by Hamas. The IDF Spokesperson’s Unit confirmed the attack in a statement, adding that direct hits were identified. The IDF said that Anis Abu Elenein had been planning to carry out a terror attack within Israel which was almost completed. The statement added that Abu Elenein was involved in other terror attack attempts in recent years, including an attempt to smuggle explosives from Gaza through Egypt into Israel. He also directed terrorist activity in Judea and Samaria, said the IDF. Ashraf Saleh was in the past a member of the Popular Resistance Committees and had been arrested and interrogated. During his interrogation he admitted to being involved in the smuggling of two terrorists into Egypt for the purpose of carrying out suicide bombing attacks in Israel. He was also involved in weapons trafficking, according to the IDF. “The IDF will not tolerate any attempt to harm the citizens of the State of Israel and IDF soldiers and will continue to act decisively and strongly against anyone who carries out terrorism against Israel,” said the IDF statement, adding that “the Hamas terror group is responsible” for all acts of terrorism coming from Gaza. Earlier, Hamas-run emergency services told AFP that two PA Arabs were killed and a third was wounded in an Israeli air strike in Gaza. 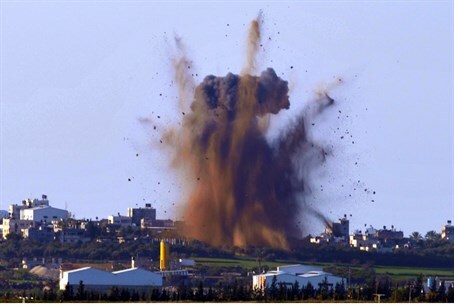 About ten days ago IAF aircraft struck a weapon manufacturing site, a center of terrorist activity and a terrorist tunnel in northern Gaza, as well as a smuggling tunnel in southern Gaza. Direct hits were detected and all aircraft returned safely to their bases. The attack came one night after terrorists from Gaza fired two Grad missiles at southern Israel. One of the missiles hit a home in the city of Netivot. A man who was sleeping in the home at the time of the attack was saved by an early-warning siren and a quick escape from his bedroom. A second missile, fired at the city of Be’er Sheva, exploded in an open area of the city. Magen David Adom treated seven people who suffered injuries from the rocket attacks. On Friday night, August 31, IAF aircraft struck two centers of terrorist activity in northern Gaza. Direct hits were identified and all aircraft returned safely to their bases. The attack came after that morning a rocket fired by terrorists from Gaza hit a home in the city of Sderot. One woman suffered from shock and the home sustained minor damage. A second rocket exploded in an open area of the Shaar HaNegev Regional Council.